We carry the highest grade Keemun Xian Zhen that was made using early spring first flush tea leaves. If you appreciate tea with smooth mouth-feel, then this is the tea you should not miss. 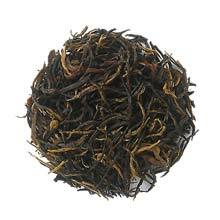 It is one of the smoothes black teas around with natural fruity sweet taste. Small, black needle-like tea leaves. You may also find some golden colored tea leaves in the mix. This tea is made using the most tender, carefully selected one-bud-one-leaf tea leaves.